Bo Burnham’s debut feature Eighth Grade has come a long way since first debuting over a year ago at Sundance. The $2 million budgeted film made over $13 million Stateside – not a huge amount comparatively, but for a film with a pint-sized amount of money behind it, that’s a pretty good result – and continued to receive endless praise from critics and audiences, with the film currently sitting at an incredibly high 99% on Rotten Tomatoes. It was even the toast of several end-of-year awards shows, where it picked up several critics’ awards, earned a Golden Globes nomination for lead actress Elsie Fisher, and although it was ultimately left out of the Academy Awards shortlist that didn’t stop writer-director Bo Burnham from scoring prizes at both the Writer’s and Director’s Guild of America Awards, winning over more prominent awards contenders like Green Book, Roma and A Star Is Born. Clearly, a lot of people loved this movie, yet it’s only now when all the dust has settled that UK audiences finally get a chance to see what all the fuss is about. I mentioned in my earlier review for this film – back when it screened at Sundance London last June – that it was a movie that should hopefully receive a UK theatrical release sooner rather than later, but as the weeks turned into months a part of me began to worry that it was going to get the Annihilation treatment and have it go straight to Netflix in all other countries outside the US. Eventually, of course, they scheduled it for a late April release the following year, but although the word-of-mouth still exists around this film I genuinely wonder if too much time has passed for audiences to still be interested in checking it out; we all know how fickle peoples’ tastes in things can be, and films are no different. If that is indeed the case, it’s a real shame because Eighth Grade is a film that’s absolutely worth seeking out, as it’s a brutally honest look at modern youth culture and the pains and anxieties that come with it, and a second viewing only confirms its essentialness. The main character of the film is a 13-year-old girl named Kayla (Fisher), who’s one week away from graduating eighth grade and moving on to high school. We follow her through the tumultuous final few days of her school year, coping with overwhelming feelings of anxiety that leave her more quiet and awkward than her contemporaries; it’s made even more painful when we see she has her own YouTube page, where she regularly posts videos that see her give life advice to the camera, with topics including how to be yourself and how to put yourself out there, which as we see very clearly throughout is advice which she can’t seem to follow if it saved her life. At first, Kayla is depicted like a typical tween of this day and age: eyes glued to her smartphone, taking several pictures of herself with Snapchat filters, being overly sensitive when she’s talking to her single dad (Josh Hamilton) at the dinner table, and applying make-up as demonstrated in a YouTube tutorial… before going back to bed and taking more Snapchat pictures with captions like “woke up like this lol”. However, what the film excels at also showing is the underlying anxiety at their core; Kayla is someone who has probably spent most if not all of her life thus far with modern technology and social media, and someone so vulnerable and susceptible to a certain tier of beauty and self-confidence would naturally struggle to keep up and feel like they are on the same level as the numerous influencers and online celebrities they know and watch religiously. Throughout the film, we see her scrolling through Twitter, Instagram, Facebook and other online platforms watching and reading about people presenting the very best versions of themselves, but as well all know we tend to only show the world a filtered version of ourselves that hide the truths of our own anxieties; Kayla, however, is less likely to know that what with her still being so young, and as such she unwillingly wears her anxieties on her sleeve while always feeling she is unable to keep up with the people she is exposed to online. The film isn’t so much an attack on social media as a whole but more of a cautionary tale of what it can lead a young person to feel in this day and age, and Burnham’s script and direction is so smart in portraying this that it not only makes its intent loud and clear, but it also allows us to both laugh at the awkwardness and sympathise with this young girl who really needs all the encouragement she can get. Fisher’s performance, too, is incredibly strong and she excels at portraying how uncomfortable it is to be the person in the room who’s part of the conversation, but too timid and shy to contribute a whole lot; given my personal anxieties, I have always struggled to lead a conversation in a larger group, and am usually the one who’s just sat there quietly listening to everyone else swap around their stories, and Fisher effortlessly captures exactly what that feels like, as well as her own special brand of tween awkwardness that generates a lot of laughs as well as a lot of sympathy. You also fear for this girl, in scenes where she appears to be having panic attacks or, in one increasingly unnerving scene in a car, groomed inappropriately by an older high school student, but most of all you hope that despite her overwhelming insecurities she makes it through them and learns to be a (slightly) more confident young adult. Those hopes carry you through this smart, thoughtful, funny and relentlessly accurate look at modern childhood, and I really do hope UK audiences really do latch onto this film as they had done in the States; it’s a very special, and essential, coming of age story. 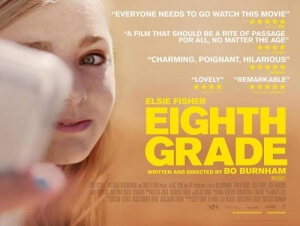 Eighth Grade is a smart and thoughtful look at modern adolescence, with a sly social commentary about social media conveyed through strong writing and direction by Bo Burnham and an outstanding lead performance by Elsie Fisher.